A new “elastomeric foam” shows great promise for future prosthetic organs and soft robotics because of its lightweight and porous structure. 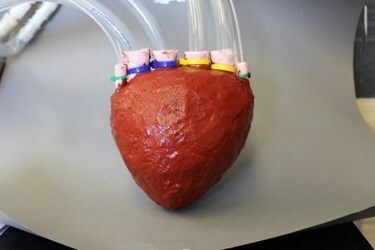 To demonstrate its potential, researchers at Cornell have used the material to 3D print an artificial heart, which can pump at realistic speeds and attain a higher flow rate than previously reported prosthetic heart models. Starting with a liquid material, researchers poured the foam into molds, making a device that was all one material and all one piece. According to the Cornell Chronicle, the material’s porous elasticity—created by mixing in salt while the polymer is liquid — allows researchers to pump both air and liquid through the prosthetic, which can stretch to three times its original size and still retain its shape. A thin outer coating of the same material (sans salt) prevents the model from leaking. Robert Shepherd, senior author of the study published in Advanced Materials, believes that the all-in-one design using a biocompatible material — silicone — is the key to building prosthetics that can exist inside the body with the fewest potential complications. Other reported artificial hearts, said Shepherd, are made out of pieces of plastic and metal, and it’s harder to get these materials to pump efficiently without falling apart or causing damage to surrounding tissue. Furthermore, the foam-like structure of the Cornell model allows it to pump fluid at much higher volumes than has been previously reported. “What we’ve done is make a foam that we can mold into any shape and cause it to inflate wherever we want,” Shepherd told WENY News. While the team is enthusiastic about its progress, the prototype isn’t nearly ready for human use. Because the silicone used is not FDA approved for use inside the body, researchers will have to replace it with another variety. Shepherd’s team also plans to investigate how the material reacts when exposed to higher body temperatures. Also in the works, Shepherd told WENY News, is a foam left ventricular assist device (LVAD) that could wrap around the heart to give extra assistance to muscles weakened by disease. Without hard surfaces or screws, the foam LVAD would pose little danger to existing tissue. According to the U.S. Department of Health and Human Services, there are approximately 121,272 Americans on the organ donor waiting list, enough to fill two large football stadiums. The effective development of artificial organs could bridge that gap for people waiting on a transplant, or even replace their organs permanently.